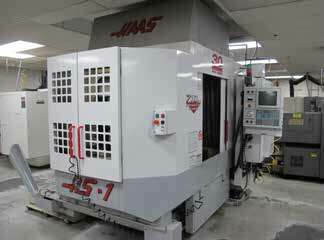 AUCTION DATE: WEDNESDAY DECEMBER 18, 2013 – STARTING @ 11:00 A.M.
2000 HAAS HS-1RP CNC HMC WITH AUTO PALLET CHANGER, CT-40, 24 ATC, 30HP, S/N 50819. 1999 HAAS HS-1RP CNC HMC WITH AUTO PALLET CHANGER, CT-40, 24 ATC, 30HP, S/N 50687. HARDINGE CONQUEST 51 CNC LATHE WITH FANUC OTC-32 BiT CONTROL, 10’’ CHUCK, 12 POSITION TURRET, TAIL STOCK, CHIP CONVEYOR, HARDINGE HARMATIC BAR FEEDER, S/N CL-117-C.
HARDINGE CONQUEST 42 CNC LATHE WITH FANUC OT CONTROL, TAIL STOCK, CHIP CONVEYOR, 10 POSITION TURRET, WITH HARDINGE HAR MATIC BAR FEEDER. HARDINGE CONQUEST GT CNC GANG TOOL LATHE WITH FANUC 18 T CONTROL, CHIP CONVEYOR, HARDINGE HAR MATIC BAR FEEDERS, S/N GT-726. 2) FADAL VMC-2216HT CNC VMC, CT-40, 20 ATC, S/N 97075908, 9511268. 3) FADAL VMC-40 CNC VMC, CT-40, 20 ATC, S/N 9412575, 9009562, 8803344. HAAS 5C 4TH AXIS INDEXER. MITSUI 8 X 18 SURFACE GRINDER WITH FACTSTOR SCOPE SYSTEM. KALAMAZOO SV-315A AUTO COLD SAW, HIGH SPEED. POWERMATIC 4 HEAD DRILL BANK. INSPECTION TOOLS, TOOL BOXES, CABINETS, DRILLS, GRINDERS AND ETC. IR SSR-EP25SE, 25 HP ROTARY AIR COMPRESSOR. INDUSTRIAL AIR MACHINE, 25 HP AIR COMPRESSOR.